Conquent - Steve Ballmer -- the walking dead? 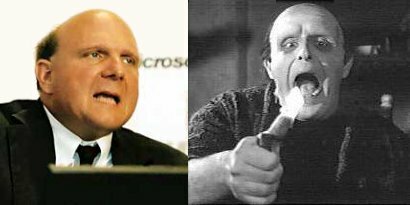 I posted this image yesterday on Facebook and Twitpic posing the question, is it just me, or does Steve Ballmer look more and more like the Monster in Young Frankenstein? Aside from the obvious separated at birth similarities, it got me thinking of the fact we might actually be seeing the walking dead -- not Ballmer himself, but Microsoft. Eric Weaver: Re: Steve Ballmer -- the walking dead? The metaphor is not entirely in-apt. Ballmer is a sell-what-you-have guy. Gates at least had a somewhat decent nose for the next thing, even when it was a bit late. And Google was wise to wait on announcing their OS until they were already too big for Crime-o-soft to "cut off their air." They are a company whose time has come and gone. More and more (and larger and larger) computer users are finding that instead of paying massive poundage for mediocre software, that they can get somewhat different mediocre software for approximately free. : Re: Steve Ballmer -- the walking dead? Oh hillarious, they look exactly alike! !